A defunct NASA climate satellite the size of a school bus fell to Earth today (Sept. 24), though NASA officials are waiting confirmation on some details of the event, including exactly when and where it occured, and whether the re-entry rained debris over parts of Canada and Africa. NASA's 6.5-ton Upper Atmosphere Research Satellite, or UARS, plummeted through Earth's atmosphere over the Pacific Ocean sometime between 11:23 p.m. EDT (0323 Sept. 24 GMT) on Friday, and 1:09 a.m. EDT (0509 GMT) Saturday, agency officials said. It was the largest NASA satellite to fall uncontrolled from space in 32 years. "The satellite was passing eastward over Canada and Africa as well as vast portions of the Pacific, Atlantic and Indian oceans during that period," NASA officials said in their latest update. "The precise re-entry time and location are not yet known with certainty." NASA officials were unable to narrow down exactly when and where the satellite would fall, but according to the agency's latest update, UARS was flying over Canada, Africa and parts of the Pacific, Atlantic and Indian Oceans during their projected window of re-entry. NASA estimates that roughly 26 large pieces of the spacecraft will survive the re-entry process and will be strewn over a 500-mile (804-kilometer) path. The largest piece of debris is expected to be approximately 300 pounds (136 kg), but it is still unconfirmed whether debris fell over land or water. Even still, NASA has advised that when it comes to satellite remnants, it's not a case of finder's keepers. In fact, the agency urged anyone who comes across what they think is a piece of the UARS satellite, however unlikely, to leave it where it is and contact local authorities. "Just remember, 'not UARS — or rather, yours — to keep,'" said space artifacts expert Robert Pearlman, editor of the website collectSPACE.com and a frequent SPACE.com contributor. "Should the public come across debris they believe to be from the downed satellite, they should alert the authorities, or the authorities may come after them." Even if it is in fragments, the UARS satellite is still property of NASA and the U.S. government, Pearlman added, which makes the debris off limits for anyone thinking of keeping a piece as a souvenir. "Regardless of where it falls, in or outside the borders of the nation, the U.S. has first right of refusal on any remnants, as either enforced by U.S. law or a United Nations' treaty," Pearlman said. But apart from the legal aspect, NASA's advice to not touch any potential pieces of satellite debris is also for safety reasons. "Though UARS has no harmful chemicals or radiological material aboard, the nature of it being ripped apart during reentry may have formed sharp, jagged edges," Pearlman said. "NASA doesn't want to see anyone inadvertently harmed while trying to collect a souvenir." As UARS' orbit decayed, some folks hoped the spacecraft's fiery demise would bring about a brilliant light show. At least one pair of lucky skywatchers in Florida were able to catch a glimpse of the doomed satellite as it circled the Earth before its final descent. Thomas Marxo Jr. told SPACE.com that he and his wife spotted the UARS satellite Friday evening as it cruised overhead to the east of South Florida. Marxo had researched the time when the spacecraft was slated to make an orbital pass, but because of cloudy skies, was about to give up when he saw the dying satellite streak across the sky. "It was very bright and traveling at a greater speed then any of the other satelittes that I have observed," Marxo said in an email. "I feel as if I have observed a part of history that I can tell the grandkids about someday." The $750 million UARS satellite is the largest NASA satellite to fall uncontrolled from space since 1979. Skylab, the first American space station, plummeted to Earth in 1979, and debris from the complex plunged into the Indian Ocean and onto parts of Australia. In 1997, Lottie Williams of Tulsa, Oklahoma reported that she was struck on the shoulder by falling debris while walking. It was later confirmed to be part of the fuel tank of a Delta II rocket. Additional debris from the Delta second stage reentry were recovered several hundred miles away in Texas. UARS was launched in 1991 aboard the space shuttle Discovery to study the ozone layer and the chemical makeup of Earth's upper atmosphere. The satellite measured 35 feet (10.7 meters) long and 15 feet (4.5 m) wide. NASA decommissioned the satellite in December 2005. 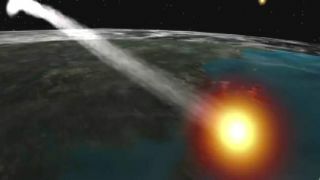 Despite UARS' uncontrolled re-entry, NASA maintained that the chance of any pieces of the satellite falling on a densely populated area was extremely remote. To date, there have been no reported injuries or casualties from re-entering satellites or spacecraft. In 1997, however, Lottie Williams of Tulsa, Okla., reported that she was struck on the shoulder by falling space junk while out walking. The debris was later confirmed to have been part of a fuel tank from a Delta 2 rocket, and other pieces of the booster were recovered several hundred miles away in Texas. Still, orbital debris experts are hoping the fall of the UARS satellite will highlight the need to promote sustainability in space. "This is not an uncommon event; space debris is re-entering our atmosphere all the time," said William Ailor, director of the Center for Orbital and Reentry Debris Studies at The Aerospace Corporation in California. "We are trying to learn everything that we can about orbital and re-entry debris so that we can protect space missions and human interests on the ground."